Yoon Kit proudly announces that according to MAMPU, “There are nearly 300 agencies using ODF already – and a detailed study will be conduct to roll out further.” Also he adds: “Glad to say after all the work, ODF has been approved by the minister as a Malaysian Standard!” John Drinkwater points it out too. After the speech, when I left the room where the President spoke, I was very happy to see the joy of Furusho, because he gave an ODF cap to Lula and the crown took some photos of Lula with the cap. 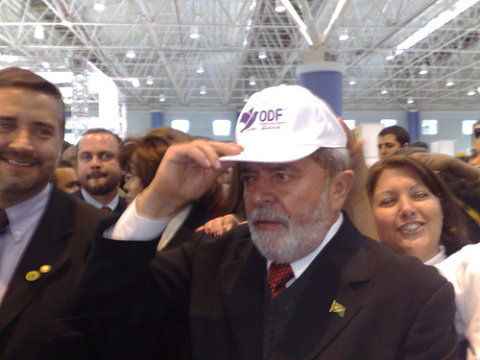 This is the kind of stuff that made Furusho’s work to be recognized by the ODF Alliance with the ODF Awards (and detail: it was Furusho’s initiative to produce the ODF shirts and caps and endure into the crowd to deliver them to President Lula. I really admire this crazy Nipo-Brazillian folk ). More Countries Move to ODF, But What About Portugal? Well, it’s nice to see some rather happy news on here for a change!